In cozy Walchen/Piesendorf, only a short car-ride away from the well-known Kaprun and Zell am See, lies this beautiful, in warm Austrian style erected apartment complex. On the ground floor, you'll find a roomy apartment of 86 m2(Top1), consisting of a spacious and atmospheric living room with a modern open kitchen and no less than three large bedrooms and two comfortable bathrooms. In addition, you'll have access to a beautiful terrace with a stunning view of the beautiful mountains of National Park Hohe Tauern. The high-end design and warm decoration will immediately make you feel at home. After a day of fun in the snow or a nice walk or mountain bike tour, you can relax in the shared wellness with sauna. A spot for your car has been reserved in the parking garage. In short, a wonderful apartment which is really worth its four stars. 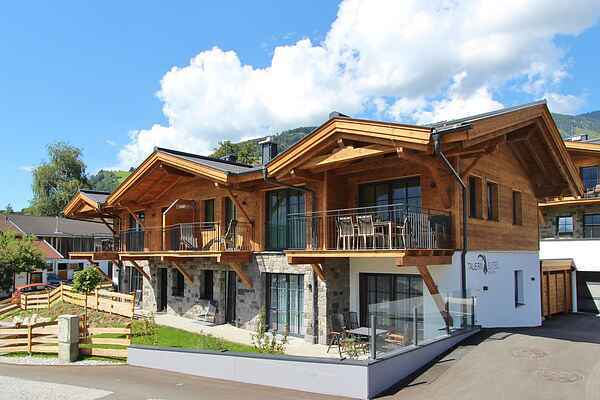 The location of this complex is perfect, sunny, within short distance of Zell am See and Kaprun, central in Salzburg. We are glad to have several beautiful golfcourses in the neighbourhood. For example GC Zell am See and Golf Club Gut Brandlhof in Saalfelden. We highly recommend you to book your tee times in advance at the clubs. Our guests will receive the Fun & Summer Card. This Card offers you deals and discounts on local activities, such as free entrance to the local swimming pool in Piesendorf. Since August 2018 a new restaurant is located in the neighbourhood. The Mitterwirt in Piesendorf, only 2,5 km from Walchen. When we visit Zell am See we like to have a drink or lunch at Crazy Daisy and for dinner we recommend Der gruene Baum. Please ask our host for activities in the neighbourhood or other needs. The ski-bus is just in front of the supermarket in Walchen. You may have to take another bus if you are in Kaprun. One bus will go to Zell am See and the other to the Kitzsteinhorn area. If you want to ski in another area we can recommend to get the extended ski card. You can ski in Saalbach, Kitzbuehl, Maria Alm and Dienten.